Sundaram Tagore and curator Betty Seid present an exhibition of works by 11 abstract artists with deep ties to the Indian subcontinent. 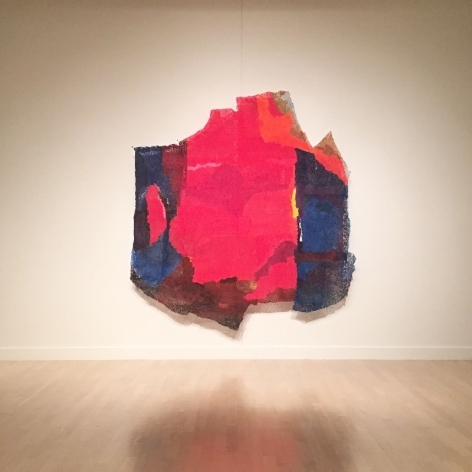 While abstraction has long been part of artistic practice in the region, this exhibition concentrates on the current landscape, spotlighting innovative process-driven works. 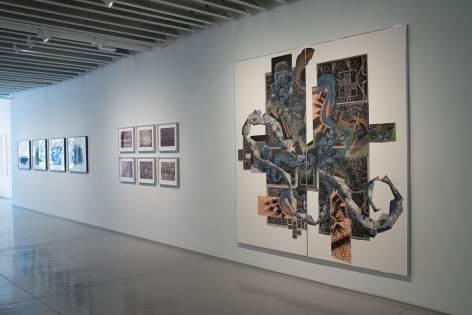 On view will be a selection of paintings, drawings, installations and sculpture by artists who manipulate text, photography and digital reproductions among other media to yield visually compelling results. A Singaporean-born artist of Punjabi descent, Simryn Gill, now active in Australia, amasses found objects, organic materials and debris from the street, which she aggregates into works that explore colonialism, migration and identity. Her Untitled (egg drawings), composed of hand-torn ovoids pasted onto ledger pages, stem from Gill’s attempt at the impossible—tearing precise circles from discarded paper. What results are imperfect shapes smattered across pages with a grid-like pattern presenting an alternative vision of perfection. 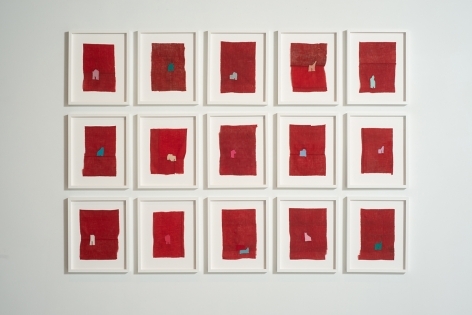 Tanya Gill’s practice centers on fiber, specifically darning or re-weaving. Since 2011, when she was awarded the Fulbright-Nehru grant to conduct research in India, she has focused on the intersection between the region’s contemporary art and handicrafts. For her Altered series, she works with local rafoogars (professional darners) to create vivid cloth constructions. 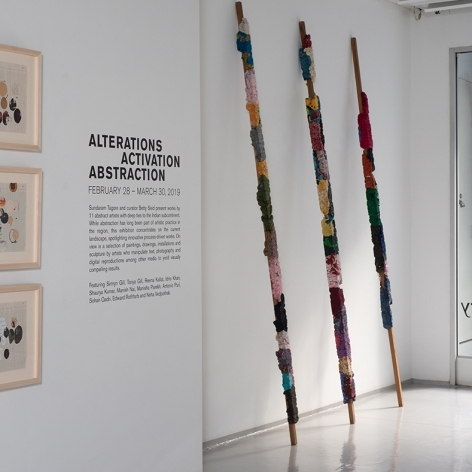 She begins her process by cutting an architectural shape into found textiles and an identical form in a contrasting fabric which the rafoogars unite by darning. 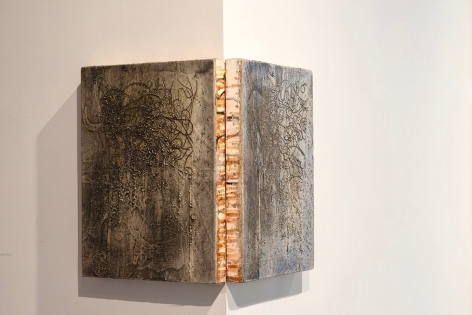 Her process of integrating and adapting her materials to create a unified work reflects her own experience assimilating into a foreign culture while retaining her individuality. Mumbai-based artist Reena Kallat’s work centers on ideas of memory, archeology and history. Kallat’s mother died of cancer when she was a child, leaving behind her saris and other ephemera. 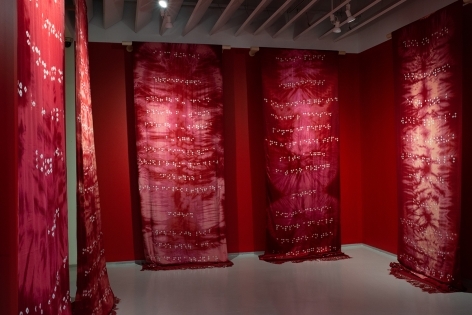 The installation Walls of the Womb is composed of fabric scrolls, each cut in the length of a sari, commemorating her mother’s absence. Using a traditional process of Indian tie and dye, she worked with Khatri families in Kutch, Gujarat, to knot the fabric before bathing it in pigment. Once untied, the dyed fabric reveals puckered white dots—a translation in braille of Kallat's mother's hand-written recipe book, displayed alongside. London-based artist Idris Khan employs photomechanical reproduction to create densely layered images that inhabit a space between abstraction and figuration. He is known for superimposing layers of musical scores, artwork and texts that have resulted in images that evoke hazy, charcoal drawings. For the Church Walk series, however, Khan used his own writing to express bereavement, when in a short span of time his mother died and his wife had a stillborn child. 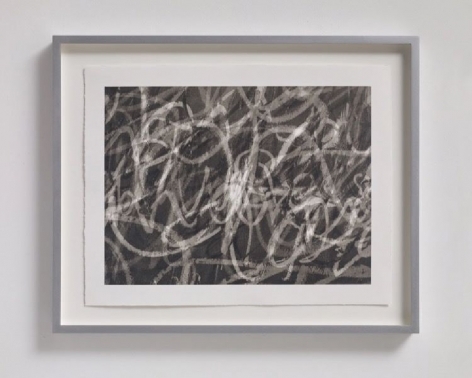 Khan created rubber stamps of his grieving words, which he stamped and layered in a repetitive (and therapeutic) process, that produced these haunting monochromatic abstract prints. Shaurya Kumar is a printmaker and painter who is attentive to accumulated memories and human imprints on cultural sites and objects. He abstracts traditional materials and forms, while preserving their historic significance. Manaat, which roughly translates as "promise”, suggests an oath made to a deity in exchange for a wish being granted. This promise is represented by a knot of string fastened onto a stone jali screen. Kumar recreates the jali latticework by stenciling soot onto the wall and interspersing strings dipped in porcelain slip and fired in a kiln. 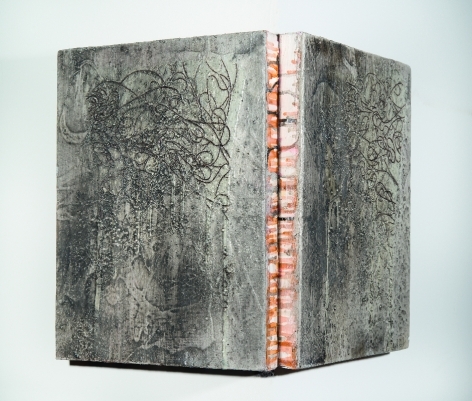 Deliberately transient and ephemeral, the work evokes ghostly vestiges of timeworn vows. Mumbai-based artist Manish Nai compresses scrap jute, old newspaper, and used clothing within molds to create totemic, minimalist sculptures. He began experimenting with waste fibers when his father’s business suffered a setback and the family was left with a warehouse of unsold jute. Embedded with memories, his vibrant materials are not only replete with autobiographical references, but also comment on Indian social structures and history. The works in this show comprise narrow wooden poles barnacled with his family’s discarded garments. The fabric appears to have fossilized and the wooden staffs have a near anthropomorphic quality. Manisha Parekh is one of the most prominent abstract artists working in India today. 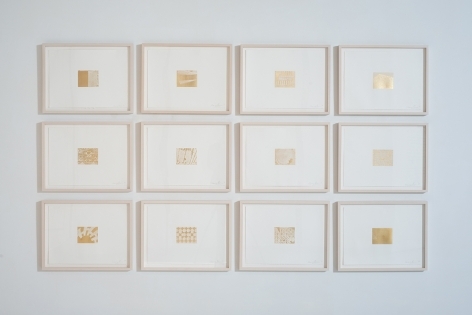 However, Parekh is reluctant to label her work as simply abstract. Instead she describes it as associative, rooted in situations, places and emotions. Composed of materials including jute rope, silk, handmade paper and tea, her fluid abstractions often draw upon the craft and textile traditions of India. A Secret Within, mounted on a color wall, comprises seven rope sculptures that Parekh compares to musical notes. Indian-born, Bogotá-based artist Antonio Puri creates complex constructions composed of countless layers of natural pigments, ink, oil, beads and sand. The predominantly gray palette of the works in this show are a nod to Le Corbusier’s monolithic concrete structures in Chandigarh, which had a powerful influence on the artist growing up. Beneath the layers of gray pigment is a riot of color, which the artist likens to a volcanic eruption waiting to happen. 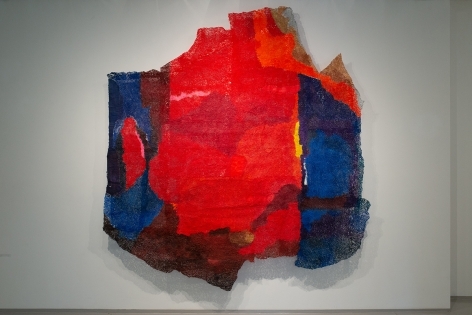 Central to his process are gestural lines created with loose pieces of string laid down in wet paint and dragged away during the drying process. Sohan Qadri’s paintings result from states of deep meditation, and are informed by the colors of India. To produce his luminous works, Qadri would bathe thick intaglio paper in acid-free water. Once swollen with liquid, he would rhythmically score the surface with various gouging and cutting tools, carving in stages while applying inks and dyes. 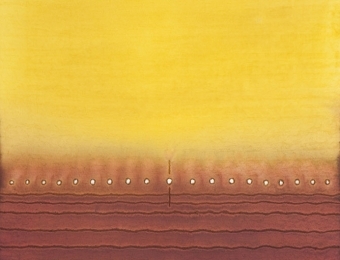 Relying on a language of orifices and elongated paths or lines, Qadri was inspired by Vajrayana or Tantric Buddhism, which emphasizes the notion of sunyata or emptiness. 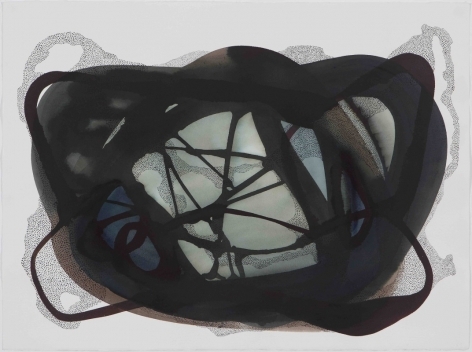 His minimalist compositions on paper are symbolic of this empty space or void from which seeds—the punctures—arise. Edward Rothfarb is an artist, scholar and art historian whose complex, architecture-inspired drawings are influenced by India's history. His recent works are inspired by jalis, openwork stone screens, carved with geometric patterns common in Hindu and Islamic courtly architecture. By piecing together digital multiples of images, he assembles sophisticated Escher-like drawings, which play with perspective and depth. 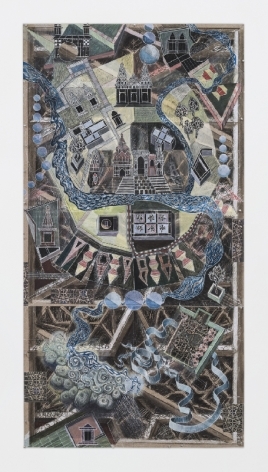 His works draw from the splayed forms of Rajput paintings, vertical narratives of Bengali pata (cloth scroll painting) as well as symbolic pilgrim maps. Neha Vedpathak is a multidisciplinary artist whose intense, process-based practice oscillates between obsession and meditation. She spends hours using a pushpin to pluck handmade Japanese paper, separating the fibers to create textured sheets. She stains the surface with pigment before transforming the two-dimensional medium into wall reliefs or installations. These meticulous constructions appear to float upon the wall as they cast ethereal shadows. Her sources of inspiration range from Rabindranath Tagore’s poetry to rituals and nature. Betty Seid is an independent curator, writer, and lecturer living in Chicago and Santa Monica. She spearheaded several important exhibitions of South Asian art during her 10-year tenure as Research Associate and Exhibition Coordinator at The Art Institute of Chicago. Her exhibition New Narratives: Contemporary Art from India was the first to show 21st-century Indian art in the United States. It opened at the Chicago Cultural Center in July 2007 and traveled across the country. 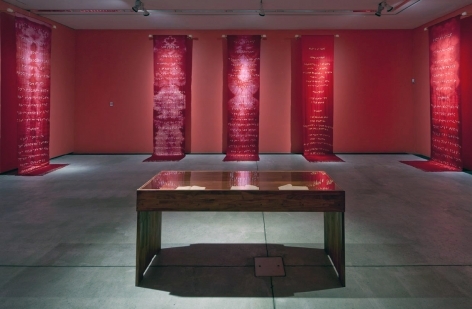 In 2011, she was the Consulting Curator for Roots in the Air, Branches Below, an exhibition of Modern and Contemporary Art from India at the San Jose Museum of Art.